It’s our favorite time of year! Fall grilling season, Thanksgiving feasts and holiday parties are just a few of the fun moments that make us love this time of year. How will you prepare your Thanksgiving turkey? There are three options—brined, injected or roasted. Each of these methods can be accomplished indoors in the oven or outdoors on the smoker or the Big Green Egg. Here’s a look at each so you can determine your turkey preference. 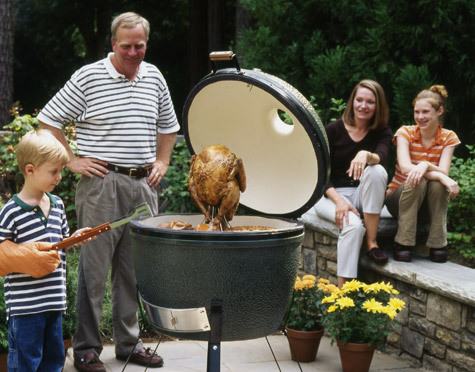 Roasted turkeys may be cooked in oven but we prefer them cooked on a smoker or Big Green Egg. Roasting a turkey is best done in a two-step process. Set the EGG up for indirect cooking with the temp at 325°F/163°C. Use a handful of pecan chips for a light, smoky flavor and to provide a deep brown color to the turkey. Spread the seasoning generously over the outside of the bird. Load the bird onto a Vertical Poultry Roaster or Rib and Roasting Rack, then place into a drip pan. Add the onion and celery to the drip pan. Fill the pan with chicken broth, wine, or water. Cook for 12 minutes per pound until the turkey has reached a safe minimum internal temperature of 165°F/74°C throughout the bird. Reserve the drippings from the drip pan to make gravy. For complete roasting recipe for turkey on the Big Green Egg, click here. Soaking a turkey overnight in a solution of salt and water ensures moist results. When you add aromatics to the brine, the resulting roast is also infused with a subtle character all its own. You can brine a turkey for the oven or smoker. Once you try brined turkey, you’ll soon want to try a “smoked” brined turkey. The turkey gains a subtle smoky flavor and is moist and succulent, and if you prefer a bolder smoky flavor, add more hickory or pecan smoking wood chips in increments during cooking. This turkey is great for holiday meals, and you can use the leftovers to make wonderful sandwiches. Injected turkeys tend to have bold flavor. Click here to view two video recipes from Dr. BBQ, demonstrating how to prepare two holiday turkey flavors– an Injected Cajun Creole Butter Turkey and a Lemon, Pepper and Herb Turkey. If you are preparing a whole turkey, just double the injection recipe and inject into the thighs as well as the breasts. These are great recipes for Thanksgiving, Christmas or a delicious meal throughout the year. Ready to get a Big Green Egg or enhance/build your outdoor kitchen? Contacts us Bay Breeze Patio at 850-269-4666 to discuss the joys of an outdoor kitchen. *For turkey temperature tips, visit ThermaWorks online.